Metropolitan Innocent, also known as Father John Veniaminov, is perhaps the greatest missionary of the Russian Orthodox church, and truly one of the ideal missionary examples within all Christian history. During the 19th century, Innocent’s life and ministry left a lasting legacy on the growing missionary activity of the Russian Orthodox church. 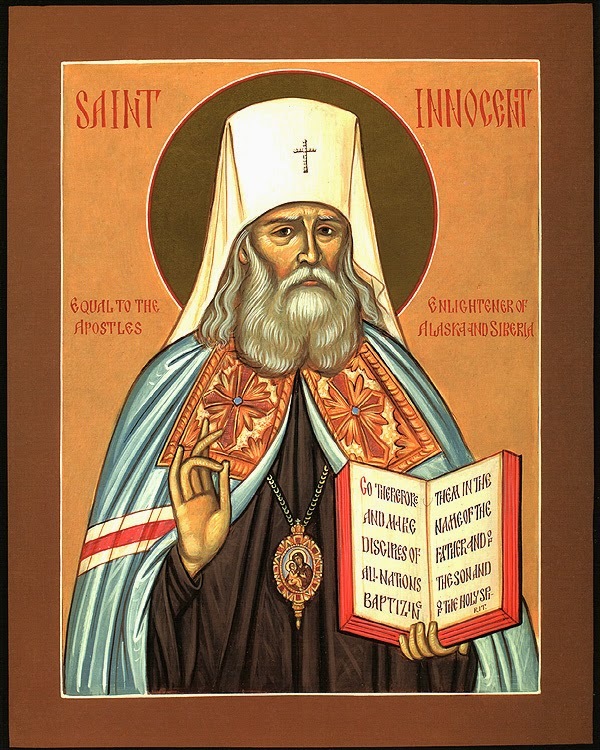 From the time of his departure to the Alaskan Islands in 1823, to the culmination of his priestly ministry as Metropolitan of Moscow (the highest clerical rank in the Russian church) in 1868, Innocent helped mold and influence the attitude of this church towards its apostolic ministry. In the early 19th century, the Russian church underwent a spiritual renewal that touched every aspect of her life. Inspired by a number of “spiritual elders” (enlightened and holy monks), a number of the Russian faithful, and the church at large, began to rediscover the fullness of the Orthodox faith and ultimately felt the need to share it with others. Initial steps at evangelism turned naturally to eastern Siberia and the lands beyond, where many Russian adventurers and traders had begun to explore. These men often traveled not only in the name of Imperial Russia, but also in the hopes of sharing the gospel with the indigenous peoples. What could once be accomplished on a piecemeal basis, however, soon proved difficult as colonies began to form in lands as far away as Alaska. It was soon clear that these men needed the support and aid from the clergy in Russia. The church sent missionary monks to the new land with a twofold mission: to act as general overseers of the Russians (who, at times, had a low standard of morality and often treated the natives inhumanely), as well as to enlighten the pagans. In 1794, ten monks arrived in Alaska to begin their ministry. Unfortunately, only a handful of them survived the rough new land, and over the next thirty years, few missionaries volunteered to take their place. The idea of spreading the faith to such far off lands did not have widespread appeal for many of the faithful in Russia at this time. As one historian noted, “Service in Alaska was voluntary and it was hard for the church to enlist volunteers for the onerous assignment” (Smith 1980:12). Even when the Bishop of Irkutsk asked the clergy of his diocese to volunteer for a post in Alaska, all turned down the call. Tougher recruitment tactics seldom worked either. “The bishop then tried selection by lot, following the manner of the election of Matthias in the Book of Acts, but the deacon who was selected in this manner refused to go abroad, preferring military service in the lower ranks as a penalty for his insubordination” (Grigorieff 1977:19). This was the situation when John Veniaminov first considered the task upon his graduation from seminary. As a top student, Veniaminov was eligible to continue his studies at the Moscow Theological Academy. He chose instead to marry the daughter of a local cleric, be ordained a priest, and begin his ministry at the parish level. As a young husband and new cleric in a comfortable parish, Father John heard the request for missionaries and rejected the possibility as impractical. He would later write in a journal, No matter what stories [I heard} about America in general or about the Aleuts in particular, no matter how he [an old Russian adventurer] tried to persuade me to go to Unalaska, I remained deaf; none of his persuasion even touched me. Indeed, how could I - why should I (humanly speaking) - have travelled God-knows-where when I had one of the best parishes in the city, when I enjoyed the love of my parishioners and the good graces of the authorities, when I already owned my own home and had a larger income than the salary being offered to whomever was assigned to Unalaska? (Garrett 1979:34). Despite his initial negative attitude, Father John remained open to the guidance of the Holy Spirit. One day as he again listened to the old Russian adventurer’s stories of how the native Aleuts longed to hear the Word of God, something suddenly changed within him. He would later write, “Blessed be the Name of the Lord! I began to burn with desire to go to such a people! Even today I recall vividly the tortures I endured while waiting impatiently to inform the bishop of my wish.” (Garrett 1979:34). Far from taking credit for this radical change of heart, Father John gave all glory and honor to God. May my own example serve as a new proof of the truth that the “Lord guides a man safely in the way he should go,” and that each of us servants of His Church is no more than an instrument in His hands. He saw fit to establish my field of ministry in America - and that despite my opposition (Garrett 1979:36). Such openness to the Spirit launched a forty-five year missionary career which culminated in the founding of the Russian Orthodox Mission Society in 1870.
this than that the Aleut who reads or listens . . . in his native tongue might understand and learn from it what he ought to believe and do for his salvation (Garrett 1979:74). Father John also produced a 1200-word Aleut-Russian dictionary and grammar book on the Fox-Aleut language, as well as a small catechetical booklet entitled, Indication of the Way into the Kingdom of Heaven. In this booklet, Father John presented the basic tenets of the Orthodox Christian faith in a simple way. Among other things, he emphasized the importance of knowing and studying the Bible. He wrote, Study diligently the foundations upon which our Orthodox Christian faith is built, that is, the actual books of Holy Scripture. . . How many Christians (or better put: how many of those who have received baptism in the name of Jesus Christ) have perished and are even now perishing simply because they do not and did not wish to pay attention to the foundations of our Orthodox faith? Anyone who despises this duty will have no defense at the fearful Judgement . . . Believe unconditionally, without doubt or speculation, in all that the Scriptures teach. . . Finally, strive to possess and stir up within yourself the desire to do what the Holy Scriptures teach. If you presently lack such desire, fall down in fervent prayer before our Savior Jesus Christ and ask Him to grant you this (Oleksa 1987:90-91). The booklet was so well written that the Holy Synod decided to publish it in Russian and Slavonic, ultimately watching it go through forty-seven printings. Clearly, this helped raise the spiritual commitment and missionary awareness of the faithful back home and established Father John’s credibility as an inspiring theologian. Father John’s respect for the culture of the Aleuts was apparent in other ways as well. He conscientiously strove to retain the positive aspects of their culture and reject only that which was completely incompatible with Orthodoxy, By doing this, he helped the Aleuts take ownership of their new faith. For example, when a discrepancy arose between Orthodox tenets and the native practices of the people, Father John did not condemn outright their way of life. Instead, he guided the people through education, and allowed them to realize the incompatibility. By this method, the changes emanated from the natives, instead of from their teacher. After ten years of ministry among the Aleuts, the mission transferred Father John to Sitka, one of the largest of the Vancouver islands. His success was apparent as “all the inhabitants of the vast territory of his parish became Christians” (Grigorieff 1977:22). With his move to Sitka in 1834, Father John began work anew among the warlike Thlingit Indians. Again, one of his primary goals was to learn the new language of the native people, create a writing system, and begin translating of the Bible and services as soon as possible. This practice characterized his life-long missionary goal. Even when he became a bishop with numerous missionaries under his care, he encouraged all of his workers to learn the language of their area as quickly as possible, translate at least one book of the Scripture into the native language, and then teach at least fifty of the Indians to read it (Grigorieff 1977:30). While Father John made monumental progress with the indigenous peoples, he also realized his own limitations, and learned to rely on God’s guidance and providence. Divine intervention can vividly be seen in Father John’s ministry among the Thlingit people. After spending several years among these fiercely independent people, Father John learned their language, along with their traditions, beliefs, and customs. He saw their deep spiritual need, and lamented that so many of them lived entirely under the influence of shamans and medicine women. Indeed, the Thlingit people seemed indifferent to any witness of the gospel. The crude and unchristian example often set by the Russian traders and explorers made the Thlingit tribe even more sure of their own spiritual independence. They saw no need or value in believing in a faith that was shared by the Russians. As Father John wrote, “This and other conditions served to check the Thlingits from embracing Christianity . . . These obstacles would have continued indefinitely had not Providence sent upon them an unheard of sickness [smallpox]” (Oleksa 1987:350). As a smallpox epidemic ravaged and ultimately felled nearly half the tribe in just two months, the only remedy the natives sought was the shaman. Nothing the shaman did brought relief. The Thlingits noticed, however, that this disease did not harm any of the Russians. Finally, they allowed a doctor from the colonies to vaccinate any who were interested. “Finally Indians came from other villages to be vaccinated,” Fr. John noted. “One must not forget that but three months previous to this, no man and no earthly power could have compelled them to take vaccination” (Oleksa 1987:351). From such an historical circumstance, the door for the gospel edged open. Father John reported, "After so memorable an event in the annals of the Thlingit history I offered my services to them for their spiritual welfare. For, after so striking and eloquent persuasion it was not so hard for me to convince them of the truth of the Gospel. At any rate I had many opportunities to talk to them. They received me, not as their enemy or as one who wished them harm, but as a man of superior knowledge. They received me with marked consideration and listened to me with patience and reverence, and in return told me of their traditions, customs and beliefs" (Oleksa 1987:352). Father John’s timing was perfect. Several days before the epidemic broke out, he had planned on visiting the Thlingits to share his understanding of the gospel with them. How providential this was that circumstances prevented him from doing so. He reported: Had I commenced my work a few days prior to the appearance of smallpox, it is almost certain that the full blame for this would have fallen upon me, as a Shaman brought in by the Russians who wanted to destroy them. Moreso because before my time no Russian missionary had ever set foot at their door either for preaching or in idle curiosity (Oleksa 1987:352). Thus, by God’s hand, the Thlingits became more receptive to the message which Father John brought. Even though it still took years for the gospel to penetrate and transform the tribe, this occasion proved to be a turning point for him and other future missionaries. In 1839, after sixteen continuous years of ministry in North America, Father John finally felt compelled to return to Russia, and make a presentation on the progress and needs of his mission to the ecclesiastical authorities in Moscow. From the moment of his arrival in St. Petersburg, he was treated as a celebrity by those riveted to his tails of high adventure in the wilds. In the midst of this acclaim, the distressing news of his wife Catherine’s death came from their hometown of Irkutsk. The next days were spent in turmoil as Father John agonized about his orphaned family and debated whether to return immediately to them. After much meditation and prayer, he decided to first finish his business with the ecclesiastical authorities. It was during this time that Metropolitan Philaret of Moscow used his influence with the royal family and received imperial patronage for Father John’s children. This intercession opened the way for his children to enter boarding schools in St. Petersburg. With the children’s future settled, Metropolitan Philaret was able to persuade Father John to accept monastic tonsure, and ultimately paved the way for his elevation to the episcopacy. With this elevation, he received the name Innocent, and became bishop of the newly established diocese of Kamchatka, the Kuril and Aleutian Islands. By becoming the first missionary bishop of the eastern lands, Innocent began the second major phase of his life’s ministry. Innocent returned to his new diocese in 1841 and fervently continued his work among the native peoples. One of his first goals as bishop was to make a fourteen month, round-trip journey throughout his entire diocese, encompassing more than 14,850 miles by ship, kayak, dog-sled, and foot. During one stretch of this trip, he recalled how he had traveled over 3300 miles by dog sled and reindeer. Such travel was extremely tiring and dangerous, particularly since the “dense, wolf-infested woods” provided constant distractions for the dogs. Innocent described that if “in a moment of inattention the driver should relax the reins just as the lead dogs caught an alluring scent across their path, then the traveler could be overturned and dragged for miles helplessly crying ‘Ko! Ko! Ko!’ to convince the beasts to stop” (Garrett 1979:168). These trying travels reminded Innocent of his early years as a missionary, when he traversed hundreds of miles in the open sea with only a small one-man kayak. Back then, he spent more than fifteen hours motionless in a kayak in near freezing weather in order to reach his parishioners. Innocent established a number of goals for himself and all the clergy from the beginning of his episcopal ministry. He emphasized the following priorities: 1) to confirm the piety of the flock, made up largely of newly-converted peoples not yet firm in the faith; 2) to bring back those gone astray or now straying from the path of faith (i.e. those who have returned to their former shamanism and those who have forgotten the fear of God to walk according to the will of their hearts); and 3) to spread the light of the Good News among those lost in the darkness of paganism (Garrett 1979:189). To meet these goals, Innocent issued creative pastoral instructions to both the clergy and lay leaders. He increased the role of the laity by ordering “pious and informed” laymen to administer the sacrament of baptism in the absence of a priest. (Whenever a priest would visit such villages, they would then complete the baptismal prayers and chrismate the newly initiated.) Along with this role, Innocent sought to create a body of laymen and women called “readers,” who would conduct weekly worship services in the absence of a priest. To the clergy, he emphasized their pedagogical and homiletical duty: Woe to him, who has been called and ordained to preach the Word of God and who is not doing it . . . We as pastors, as teachers, as heirs of the apostles, have to keep up with our calling, and that means we have to teach. Otherwise we are like pagan priests, just performers of mysteries and rituals (Grigorieff 1977:29-30). He also emphasized the need to meet the people at their level and stressed the need to teach and preach with simplicity. In explaining religious teachings, one must speak deliberately, clearly, distinctly, and as succinctly as possible. Otherwise your sermon will have little effect . . . to explain that all the teachings of Jesus Christ tell us to repent, to believe in Him and to have unselfish, pure love for Him and for all people (Grigorieff 1977:30). By the end of his first decade as bishop, Innocent reported back to the Holy Synod that over sixty churches and chapels had been built, with over 23,100 Christians in his diocese of Kamchatka, the Kurile and the Aleutian Islands. Along with this, his most exciting achievement was the establishment of a local seminary for the training of native priests (Grigorieff 1977:33,34). Over the next seventeen years, Innocent continued to act as a missionary bishop within three other newly established dioceses in eastern Siberia. Although he slowly moved away from his initial work in Alaska, his love and concern for that land never waned. In fact, following the sale of Alaska to the United States in 1867, Innocent prophetically envisioned the future of the Orthodox mission in America: I see in this event one of the providential ways by which our Orthodoxy can penetrate into the United States, where it already has started to attract serious attention. If asked, I would recommend the following measures . . . A new bishop who knows the English language should be appointed to America. His staff should be manned by people who also know the English language . . . Ordain to the holy priesthood American citizens who had converted to Orthodoxy; the bishop and the clergy of all our parishes should be permitted to celebrate the Divine Liturgy and other church services in the English language. It is self-evident that the service books should be translated into the English language for this purpose (Gregorieff 1977:35). Once again, Innocent exemplified constant concern and respect for the native peoples of different cultures. He sought to contextualize Orthodoxy into whatever new settings the faith found itself. In 1868, after twenty-seven years as a missionary bishop, and forty-five years within the missionary field, Innocent returned to Russia in order to be elevated as Metropolitan of Moscow, the highest ecclesiastical office within the Russian church. During those years as head of the church, Innocent achieved a life-long dream of founding the Russian Orthodox Mission Society. His plan and vision for this society was to help support and direct all the missionary endeavors of the church. He noted in the inaugural meeting of the society: In comparison with the number [of unchurched people] we have very few missions, and the ones which have already been established need funds in order to maintain and expand their activities. The holiness of this work and its great importance . . . are obvious, and our chief source of funds for this development must be the concern and zeal of all Orthodox Christians. The Missionary Society is open to all - rich and poor alike. The comfort of service this great work provides is given to anyone who wishes and is able to do so according to his abilities (Garrett 1979:306). Along with raising funds, he saw a primary focus of the society to be prayer: First and foremost, we must pray. . . In the matter of conversion, prayer becomes the means itself - and a most effectual of means, for without prayer one cannot expect success even under the most perfect of circumstances. Thus, it is not our missionaries alone who must pray. No, we their brethren must further their work by our own prayers. And what ought we to pray for? First, that the Lord will send workers into His harvest; second, that He will open the hearts of those who listen to the Word of the Gospel; third, that He will increase our Society’s numbers more and more; and finally, that He will strengthen and confirm in us the desire we all now feel to further this work to the attaining of our goal (Garrett 1979:309). Over the next forty-five years, the Orthodox Mission Society greatly influenced the missionary work of the church until the Bolshevik Revolution of 1917. During its existence, hundreds of missionaries were sent and supported throughout the vast lands of Siberia and the eastern end of the Russian Empire, as well as Alaska, Japan, China, and Korea. On March 31, 1878, Metropolitan Innocent died at the age of eighty-two. The church, by canonizing him “Apostle to America,” proclaimed him to be truly one of the greatest missionary figures in church history. As one author noted, no other person in modern times has come close to matching the missionary feats of Saint Innocent. He has been called a “renaissance man” by some. He was a master carpenter, watchmaker, inventor, linguist, original translator, noted ethnographer, sociologist, teacher, and scholar. But for all these talents, were it not for his first calling, as missionary priest and bishop, none of these talents would have been fully utilized (Fester 1992:31). Through the life of Innocent, the church once again found a stalwart champion of Orthodoxy who sought to lift up her faithful missionary tradition for all the world to see. His life and work followed and propelled forward the path of his Orthodox predecessors, and thus fulfilled one of the greatest responsibilities of the church - her missionary call. *Source: Missionaries, Monks and Martyrs: Making Disciples of All Nations by Fr. Luke Veronis. Light and Life Publishing Company, 1994.